"Dot space" redirects here. For the animated film, see Dot in Space. In computer programming, white space is any character or series of characters that represent horizontal or vertical space in typography. When rendered, a whitespace character does not correspond to a visible mark, but typically does occupy an area on a page. For example, the common whitespace symbol U+0020 SPACE (HTML &#32;), also ASCII 32, represents a blank space punctuation character in text, used as a word divider in Western scripts. With many keyboard layouts, a horizontal whitespace character may be entered through the use of a spacebar. Horizontal white space may also be entered on many keyboards through the use of the Tab ↹ key, although the length of the space may vary. Vertical white space is a bit more varied as to how it is encoded, but the most obvious in typing is the ↵ Enter result which creates a 'newline' code sequence in applications programs. Older keyboards might instead say Return, abbreviating the typewriter keyboard meaning 'Carriage-Return' which generated an electromechanical return to the left stop (CR code in ASCII-hex &0D;) and a line feed or move to the next line (LF code in ASCII-hex &0A;); in some applications these were independently used to draw text cell based displays on monitors or for printing on tractor-guided printers—which might also contain reverse motions/positioning code sequences allowing yesterdays text base fancier displays. Many early computer games used such codes to draw a screen (e.g. Kingdom of Kroz). The term "white space" is based on the resulting appearance on ordinary paper. However they are coded inside an application, white space can be processed the same as any other character code and programs can do the proper action as defined for the context in which they occur. The most common whitespace characters may be typed via the space bar or the tab key. Depending on context, a line-break generated by the return or enter key may be considered white space as well. The table below lists the twenty-five characters defined as whitespace ("WSpace=Y", "WS") characters in the Unicode Character Database. Seventeen use a definition of white space consistent with the algorithm for bidirectional writing ("Bidirectional Character Type=WS") and are known as "Bidi-WS" characters. The remaining characters may also be used, but are not of this "Bidi" type. Note: Depending on the browser and fonts used to view the following table, not all spaces may be displayed properly. space Used for interword separation in Ogham text. Normally a vertical line in vertical text or a horizontal line in horizontal text, but may also be a blank space in "stemless" fonts. Requires an Ogham font. space Width of one en. U+2002 is canonically equivalent to this character; U+2002 is preferred. space Also known as "mutton quad". Width of one em. U+2003 is canonically equivalent to this character; U+2003 is preferred. space One sixth of an em wide. In computer typography, sometimes equated to U+2009. space Narrow no-break space. Similar in function to U+00A0 No-Break Space. When used with Mongolian, its width is usually one third of the normal space; in other context, its width sometimes resembles that of the Thin Space (U+2009). space As wide as a CJK character cell (fullwidth). Used, for example, in tai tou. Related whitespace characters without Unicode character property "WSpace=Y"
Format MVS. A narrow space character, used in Mongolian to cause the final two characters of a word to take on different shapes. It is no longer classified as space character (i.e. in Zs category) in Unicode 6.3.0, even though it was in previous versions of the standard. Format Zero-width non-breaking space. Used primarily as a Byte Order Mark. Use as an indication of non-breaking is deprecated as of Unicode 3.2; see U+2060 instead. ^ "Unicode 9.0 UCD: PropList.txt". 2016-06-01. Retrieved 2016-06-21. ^ a b c d e f g h i j k l m n o This character is blacklisted for domain names by browsers because it might be used for phishing. U+2423 9251 Open box Control Pictures ␣ Used in block letter handwriting at least since the 1980s when it is necessary to explicitly indicate the number of space characters (f.e. when programming with pen and paper). Used in a textbook[which?] (published c. 1985 by Springer-Verlag) on Modula-2, a programming language where space codes require explicit indication. Also used in the keypad silkscreening[n 1] of the Texas Instruments' TI-8x series of graphing calculators. ^ Above the zero "0" or negative "(‒)" key. The Braille Patterns Unicode block contains U+2800 ⠀ Braille pattern blank (HTML &#10240;), a Braille pattern with no dots raised. Some fonts display the character as a fixed-width blank, however the Unicode standard explicitly states that it does not act as a space. The Cambridge Z88 provided a special "exact space" (codepoint 160 aka 0xA0) (invokable by key shortcut ⌑+SPACE,) displayed as "…" by the operating system's display driver. It was therefore also known as "dot space" in conjunction with BBC BASIC. Under codepoint 224 (0xE0) the computer also provided a special three-character-cells-wide SPACE symbol "SPC" (analogous to Unicode's single-cell-wide U+2420). Text editors, word processors, and desktop publishing software differ in how they represent white space on the screen, and how they represent spaces at the ends of lines longer than the screen or column width. In some cases, spaces are shown simply as blank space; in other cases they may be represented by an interpunct or other symbols. Many different characters (described below) could be used to produce spaces, and non-character functions (such as margins and tab settings) can also affect white space. In computer character encodings, there is a normal general-purpose space (Unicode character U+0020) whose width will vary according to the design of the typeface. 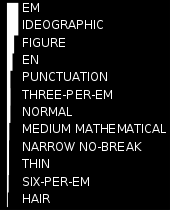 Typical values range from 1/5 em to 1/3 em (in digital typography an em is equal to the nominal size of the font, so for a 10-point font the space will probably be between 2 and 3.3 points). Sophisticated fonts may have differently sized spaces for bold, italic, and small-caps faces, and often compositors will manually adjust the width of the space depending on the size and prominence of the text. In addition to this general-purpose space, it is possible to encode a space of a specific width. See the table below for a complete list. By default, computer programs usually assume that, in text with word wrap enabled, a line break may as necessary be inserted at the position of a space. The non-breaking space, U+00A0, named entity: &nbsp;, is intended to render the same as a normal space but prevents line-wrapping at that position. Hard spaces (contrasted with "soft spaces") may be defined by some word processors and operating systems as either a non-breaking space, a non-combining/non-expanding space, or some other special character. Em dashes used as parenthetical dividers, and en dashes when used as word joiners, are usually set continuous with the text. However, such a dash can optionally be surrounded with a hair space, U+200A, or thin space, U+2009. The hair space can be written in HTML by using the numeric character references &#x200A; or &#8202;, or the named entity &hairsp;, but is not universally supported in browsers yet, as of 2016. [update] The thin space is named entity &thinsp; and numeric references &#x2009; or &#8201;. These spaces are much thinner than a normal space (except in a monospaced (non-proportional) font), with the hair space being the thinner of the two. In programming language syntax, spaces are frequently used to explicitly separate tokens. Runs of whitespace characters (beyond the first) occurring within source code written in computer programming languages (outside of strings and other quoted regions) are ignored by most languages; such languages are called free-form. In a few languages, including Haskell, occam, ABC, and Python, white space and indentation are used for syntactical purposes. In the satirical language called Whitespace, whitespace characters are the only valid characters for programming, while any other characters are ignored. Still, for most programming languages, excessive use of white space, especially trailing white space at the end of lines, is considered a nuisance. [by whom?] However correct use of white space can make the code easier to read and help group related logic. The C language defines white space characters to be "... space, horizontal tab, new-line, vertical tab, and form-feed". The HTTP network protocol requires different types of white space to be used in different parts of the protocol, such as: only the space character in the status line, CRLF at the end of a line, and "linear white space" in header values. In commands processed by command processors, e.g., in scripts and typed in, the space character can cause problems as it has two possible functions: as part of a command or parameter, or as a parameter or name separator. Ambiguity can be prevented either by prohibiting embedded spaces, or by enclosing a name with embedded spaces between quote characters. Some markup languages, such as SGML, preserve white space as written. Web markup languages such as XML and HTML treat whitespace characters specially, including space characters, for programmers' convenience. One or more space characters read by conforming display-time processors of those markup languages are collapsed to 0 or 1 space, depending on their semantic context. For example, double (or more) spaces within text are collapsed to a single space, and spaces which appear on either side of the "=" that separates an attribute name from its value have no effect on the interpretation of the document. Element end tags can contain trailing spaces, and empty-element tags in XML can contain spaces before the "/>". In these languages, unnecessary white space increases the file size, and so may slow network transfers. On the other hand, unnecessary white space can also inconspicuously mark code, similar to, but less obvious than comments in code. This can be desirable to prove an infringement of license or copyright that was committed by copying and pasting. In XML attribute values, sequences of whitespace characters are treated as a single space when the document is read by a parser. White space in XML element content is not changed in this way by the parser, but an application receiving information from the parser may choose to apply similar rules to element content. An XML document author can use the xml:space="preserve" attribute on an element to instruct the parser to discourage the downstream application from altering white space in that element's content. In most HTML elements, a sequence of whitespace characters is treated as a single inter-word separator, which may manifest as a single space character when rendering text in a language that normally inserts such space between words. Conforming HTML renderers are required to apply a more literal treatment of white space within a few prescribed elements, such as the pre tag and any element for which CSS has been used to apply pre-like whitespace processing. In such elements, space characters will not be "collapsed" into inter-word separators. In both XML and HTML, the non-breaking space character, along with other non-"standard" spaces, is not treated as collapsible "white space", so it is not subject to the rules above. Such usage is similar to multiword file names written for operating systems and applications that are confused by embedded space codes—such file names instead use an underscore (_) as a word separator, as_in_this_phrase. Another such symbol was U+2422 ␢ Blank symbol. This was used in the early years of computer programming when writing on coding forms. Keypunch operators immediately recognized the symbol as an "explicit space". It was used in BCDIC, EBCDIC, and ASCII-1963. Regular expression#Character classes for the white-space character class. ^ "The Unicode Standard". Unicode Consortium. ^ "Character design standards – space characters". Character design standards. Microsoft. 1998–1999. Retrieved 2009-05-18. ^ "General Punctuation" (PDF). The Unicode Standard 5.1. Unicode Inc. 1991–2008. Retrieved 2009-05-13. ^ Sargent, Murray III (2006-08-29). "Unicode Nearly Plain Text Encoding of Mathematics (Version 2)". Unicode Technical Note #28. Unicode Inc. pp. 19–20. Retrieved 2009-05-19. ^ Gillam, Richard (2002). Unicode Demystified: A Practical Programmer's Guide to the Encoding Standard. Addison-Wesley. ISBN 0-201-70052-2. ^ "Network.IDN.blacklist chars". MozillaZine. 2009-02-24. Retrieved 18 September 2010. ^ "American Standard Code for Information Interchange, ASA X3.4-1963". American Standards Association (ASA). 1963-06-17. Archived from the original on 2016-05-26. Retrieved 2014-05-23. ^ "Cambridge Z88 User Guide". 4.7 (4th ed.). Cambridge Computer Limited. 2016 . Basic concepts - The keyboard. Archived from the original on 2016-12-12. Retrieved 2016-12-12. ^ a b c "Cambridge Z88 User Guide". 4.0 (4th ed.). Cambridge Computer Limited. 1987. Appendix D. Archived from the original on 2016-12-12. Retrieved 2016-12-12. ^ a b c "Cambridge Z88 User Guide". 4.7 (4th ed.). Cambridge Computer Limited. 2015 . Appendix D. Archived from the original on 2016-12-12. Retrieved 2016-12-12. ^ "3.3.3 Attribute-Value Normalization". Extensible Markup Language (XML) 1.0 (Fifth Edition). World Wide Web Consortium. ^ "9.1 White space". W3CHTML 4.01 Specification. World Wide Web Consortium. This page was last edited on 2 April 2017, at 22:40.